Every cuisine has these key aspects that are not just essential to understanding the cuisine but also fill in the missing links to the growth of that cuisine over centuries. In Goa, one such aspect is that of the Saraswat Hindu Goan food, that I was made aware of at the Khandeparkar home in Ponda. Khandeparkars are a joint family of 50 living in this massive 35-bedroom house for close to a 100 years. Sitting at the 50-seater dining table for lunch, I tasted a divine preparation, a food memory forever called 'Hooman'. 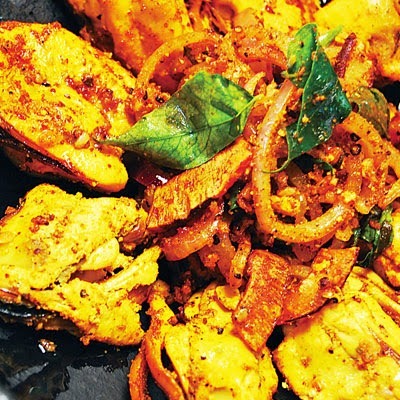 The taste and flavours came across as predecessors to the Goan fish curry. This curry and the subsequent enlightenment at the lunch table answered a lot of questions and left me with a lot more. Saraswat Brahmins, the first Goan settlers, had come to Goa in around 600 BC, and settled down in the talukas bordering Maharashtra and Karnataka. Fear of religious persecution, first by the Sultanate and then by the Portugese, caused them to retreat further and live quietly, unnoticed. As a result of this, the authenticity of their food has remained. Although the food and eating habits that they bought to Goa evolved over centuries with Muslim and Christian influences, the original state was always with them, tucked away and sanitized. In conversations with Odette Mascarenhas, an authority on Goan food and a super passionate human being, she agreed to the fact that it's very rare that a cuisine evolves and yet the nascent form of it, which is close to 2000 years old remains alive, as is. She has an amazing tale to tell on the subject, the 'Tale of two Curries'. That's where the Hooman that I ate at the Khandeparkars' fits in. Hooman eventually ended up becoming the Kodhi or the goan fish curry over the centuries. Saraswats use lime and tamarind pulp for souring unlike toddy vinegar and kokum used in Christian homes, both of which were discovered much later. Also the Xacutti, another signature preparation of contemporary Goa, evolved from shagoti, another Saraswat preparation. So, I guess its time for all Goan food enthusiasts like me to get up and give the saraswats a big hand for giving us Goan food as we know it today and yet preserving it like it was 2000 years ago. 1. In a pan stir, fry coriander seeds till they turn brown. Add coconut until turns brown. 2. Grind everything all masalas together with tamarind. 3. Slice onions, sauté lightly and add the masala. 4. Add little water and toss the mussels, Cover and cook till done.